The Rock Island Independents can be traced back to 1902 when they faced the Davenport Standards and defeated them by a score of 6 - 0. Teams back in those days were neighborhood teams, athletic club teams, social club teams and occasionally business owned teams. Players came together in the fall, held a couple of practices and tried to schedule games with other local teams. 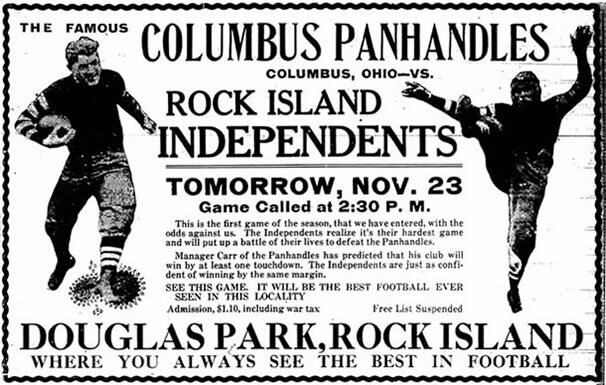 The Independents were a neighborhood team based out of Rock Island Illinois. The team was not affiliated with any organizations or clubs and due to this fact they were named the Independents. Including 1902-1903, 1907-1909 and 1912, (and beyond) there were several iterations of the Independents. From the beginning, the Independents were a competitive team. In 1907 they finished with 2 wins, 1 loss and 3 ties and outscored their opponents 82 to 12. 1908 they were undefeated in four games. 1909 the team only organized for 3 games, they were beaten badly in all three. 1910 and 1911 the team disappeared but many future Independents were seen either playing for the High School team or for other Rock Island teams. 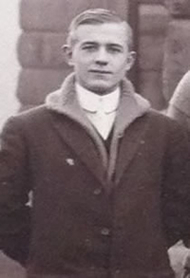 In 1912 Jack Roche organized the team and took over as team manager. The Independents claimed the Illinois State title as they went 8-0 while outscoring their opponents 212-0. 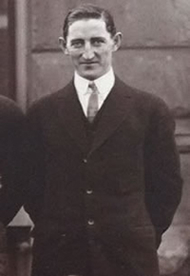 In 1913 Jack Roche hired Walter Flanigan as his assistant manager. The team went 6-0-1. The same two were back running the team in 1914 and they finished with a 5-2 mark. In 1915 Flanigan took over the team as team manager and the team went 5-1-1 with their only loss being to the Moline Red Men. From 1912-1916 the team grew in popularity as did the popularity of football in America. The crowds grew from a couple hundred in 1907 to as many as 6,000 in 1916. With no organization in football, it was common for teams to try to attract the best players, even if it meant collegiate or high school players. With the Independents popularity and reputation they were able to get the best talent in the area. Games with the rival Moline Indians and the Davenport Athletic Club were their toughest games. In 1916 there was some confusion as to who the team's manager was, both John Roche and Walter Flanigan formed Rock Island teams. Both teams existed into the season but eventually several of Roche’s men deserted after he failed to secure a second game. Roche and Flanigan struck a deal and the Flanigan eleven were able to pick up the Independent's name and the rights to the field which Roche had secured for his home games. The Independents struggled that year most likely due to the confusion at the start of the season. The team split the series with the Moline Indians while going 0-1-1 against the Davenport AC. For the first time since 1912 they could not claim to be the best team in the Tri-Cities. Due to the early season confusion all 3 Tri-City teams agreed that player jumping was bad for the game. Management of the three agreed that once a player had committed to one team that the other managers would leave him alone. The Independents, Moline and Davenport all played well vs teams from outside the area giving Flanigan credibility going into 1917. TIME TO GROW... In 1917 Flanigan decided it was time to try to gain more recognition and possibly compete with some of the best teams in the Midwest. The team started out 6-0 and they received several game requests, many of which Flanigan denied. Flanigan wanted to schedule a game with a team that everyone knew. He tried to schedule the famous Fort Wayne Friars, the game fell through. Across the river a nationally recognized team beat the rival Davenport AC 40-0. Flanigan invited the same team back for a game in Rock Island. The Minneapolis Marines accepted the challenge and agreed to treturn 2 weeks later. The Independents played a good game but in the end the Marines were able to come away with a 7 to 3 victory. In 1917 these 3 Minneapolis Marines played against and then for the Independents - Walt Bueland - Rube Ursella - Fred Chicken. After 3 tough losses, the Independents were able finish on a positive note by beating Davenport easily. Davenport would disagree that they even played the Independents since Walter Flanigan had brought in several Minneapolis Marines to play against their rivals. In the end the move paid off as the Independents won 23-7. With a 7-3 record, the Independents were still a good team and the lessons they learned would help them in the future. In 1918 World War 1 put a damper on what was becoming professional football and many teams did not form. The Independents went 5-0 as they played a mixture of service teams and easy local opponents. SHOT AT A CHAMPIONSHIP... In 1919 Walter Flanigan was able to lure quarterback Rube Ursella away from the Minneapolis Marines. With Rube came several other players as well as the Minnesota Shift offense that they ran. Flanigan’s ability to build the Independents up near the level of teams like the Minneapolis Marines, the Fort Wayne Friars and the Pine Village Eleven should be noted. The team carried little or no nationally recognized players prior to the season. Flanigan's track record may have been a big factor in the decision of Ursella to come to Rock Island. No sources show Ursella playing college football anywhere. He must have bought into the ideas of owner Flanigan and saw it as a great opportunity to play for him in the city of Rock Island. The Independents got off to an easy 2-0 start before facing the team from Hammond Indiana know as the Hammond $20,000 Bobcats/All Stars. The team carried many famous ex-collegiate stars, including a George Halas. Unfortunately the Independents gave up a score late in the 4th quarter and lost the game 12 to 7. The Independents perfect season was over and so were their chances at the Professional Football Championship, or so they thought. The team went on to win 6 of their remaining 7 games and played the famous Pine Village AC to a 0-0 tie. The Independents finished the season 9-1-1 while outscoring their opponents 309 to 12. The season was a huge success and by beating teams from Cincinnati, Columbus, and Akron the Independents did achieve their goal of gaining national recognition. To right - An ad from the Rock Island Argus on 9-26-1916. The ad is for the Rock Island Brewing Company which still exists today. THE RIGHT HAS BEEN EARNED... 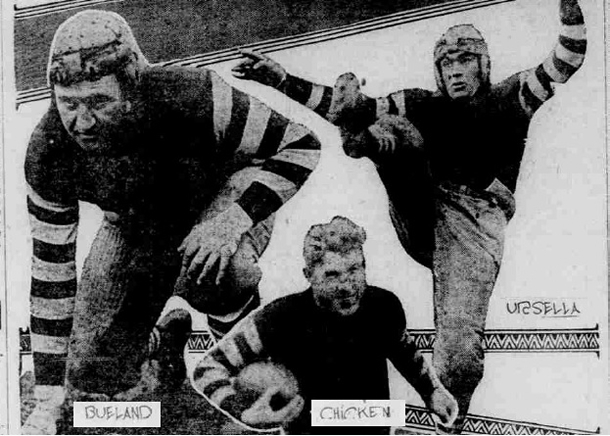 In 1919 the Independents played 3 teams from Ohio, soundly beating all 3. The truth is that the team from Canton Ohio, (run by Jim Thorpe and managed by Ralph Hay) had talked with the Independents all season about scheduling a game. With the season nearing an end the Bulldogs were undefeated and the Independents had just 1 loss. The Independents felt they deserved a shot at Canton to settle the Championship. Rock Island had beaten many of the same teams and had scored nearly 100 more points. Canton showed interest in the game but they must have decided better, they cancelled the game at the last minute and claimed the team had disbanded. Both the Bulldogs as the and the Independents claimed the 1919 championship. It was a great year for the Independents. Even though Ralph Hay and his Canton did not play Rock Island that year they did take note. In 1920 when it came time to gather the best teams in the country to form a professional football league, Flanigan and the Independents were invited. The league would be called the American Professional Football Association until 1922 when it would be renamed the National Football League. The Independents were a success in the newly formed league, between the years of 1920 and 1925 they lost just 6 games to teams not named either the Staleys or the Bears. Now you know how a liitle team in Rock Island made it all the way to the NFL. The above summary of the history of the Rock Island Independents was written by the owner of this website. The details in each summary of each year can be found in the Rock Island Argus newspaper. I would also like to thank Bob Carroll and Bob Braunwart for their Professional Football Research Association article The Coffin Corner: Vol 5, No. 3 (1983) titled "Rock Island Independents" - an article which contains a lot of general information on the early days of professional football.